North of Wellington, there are several hill ranges and forest parks that can be easily linked together to give great long days on the bike. Coming back in to the city, you must go round, or over, the Belmont hills. The Belmont is a combination of regional park and private land, a hill range running southwest-northeast. There are several dirt roads crossing the range north to south. As of March 2016, the lower Korokoro gully was closed because of flood damage. The Paekakariki hill road runs south from Paekakariki village on the Kapiti coast, to Pauatahanui on the Porirua harbour. It's a beautiful run, a classic Wellington ride, but it's not very long. Dodo combined it with a climb over the Belmont hills to Petone at the bottom of the Hutt valley, using Belmont Road to get to the main ridgeline, then the western half of the Puke Ariki Traverse to Belmont trig, and down to Petone via the Korokoro. 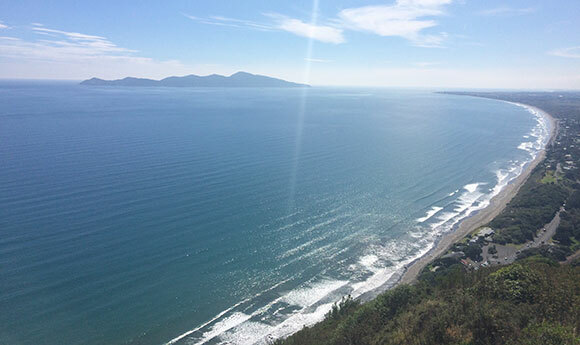 Kapiti Island from the summit of the Paekakariki hill road. The Paekakariki hill road ends at Pauatahanui where you can get an acceptable coffee these days; then head down past the church (worth a look) to the roundabout, and turn left onto the Haywards road (State Highway 58). Follow that for 1.5km then turn right into Belmont Road, where you'll enjoy 5km of the best climbing there is, up through the woods to the start of the cleared grazing area and finally to the park entrance. Belmont road, lower section, near Haywards. The seal runs out just after this. The Puke Ariki traverse is well advertised, but not very well signposted and the central section involves some guesswork. When Belmont Road turns into a gravel road, keep going. When it appears to split while sidehilling round a summit, you can take either fork unless signs say otherwise; they join again 1km further on. The buildings on either side were built for munitions storage during the war; some of them are now used by the farm but others have clearly had no-one in them for years. Improbably, you will soon encounter a huge gas station where the trails rejoin and a well graded gravel road comes up from Normandale in the Hutt Valley. Don't go down Normandale Road - take the track heading west, slightly uphill, where Normandale goes steeply down to the southwest. The track meanders past more buildings, climbing for a short way then turning north to the airstrip. Here you must turn - Dodo could find no path. But good luck even finding the airstrip. It's a reasonably flat shallow depression right beside the track on your left (west), downhill of you. The only way I found to continue the traverse was to walk right over the southeast end of it, then hop back on and ride due south to the end of the gully about 700m in front of you. Climb due west on a wide sort of cleared section (I won't call it a road) onto a low but obvious ridgeline heading west. Follow this northwest, west, southwest and south as it rounds the top of a bowl-shaped gully to the south. The track is patchy, but there - soon a much more obvious trail comes up from the north and joins it. Follow that all the way to Belmont Trig (more or less south, the highest thing around). The descent down the other side into Korokoro is murderously steep in places and the track through the upper part of Korokoro itself has been in a bad way for years. Dodo first went through there in 2012, after a number of trees had fallen, and ended up carrying the bike nearly 2km through the river to get out. Check to see if it's open before doing this route because you really, really wouldn't want to climb out of it back the way you came. This route also takes in the Belmont trig, climbing up Statton street from Petone to the park entrance and taking a steep, direct route to the summit. From the top it goes north along a wavy but distinct track which pops out above the Takapu road entrance. 2km north of the trig, when a deep gully appears on your right, with a new fence and inviting-looking fresh track next to it, running downhill toward the gully, do not be tempted. It goes down alright; then it comes back up again. Instead, carry straight on over the fading track on the rounded top of the hill. Go down the far side of it aiming for the large macrocarpas on the ridgeline; the road is just behind them. Follow the road down and turn left where it abruptly comes off the hill, beside a couple of sheds. Takapu road is a few hundred metres along this track. Turn left to reach Takapu Road station in about 5km. Hop under the railway and then take Middleton Road back to Johnsonville. The mapped route follows back roads to Wellington via Kelburn. Horokiwi Road is a classic short sharp climb from Wellington which goes up the west edge of the Belmont range and gives terrific views east over the Korokoro gully and the Horokiwi bridleway. The road surface is good but it's narrow and steep (particularly the first section coming up from the Hutt Road). Heavy trucks use this first short section to access the quarry on your left as you ride up. The quarry is supplying materials for developments uphill and south of the quarry, but has its own dirt road to transport the stuff onto the site, so you won't meet trucks on the higher reaches of the road. Horokiwi road is a fantastic short ride in lovely scenery. Unfortunately there is currently no through road from the northern end. If you're on a mountain bike you can force a route down west to Havana Rise in Grenada from either Woolaston Way or Hillcroft Road. Alternatively, 200m past the Woolaston Way turnoff, at a left bend in the road, a track descends into Grenada North Park. It comes out at Caribbean Drive, but does involve some route finding. Keep taking the trail that trends north. 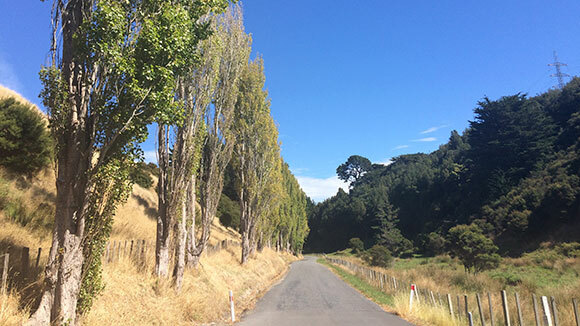 Moonshine road climbs into the Akatarawa range from the Trentham Reserve on the Hutt side, and comes out at Judgeford on the Haywards Hill road. 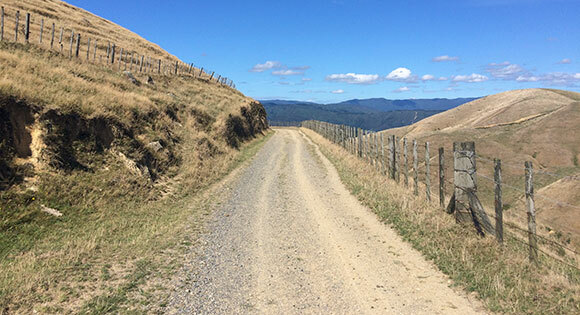 Riding it, plus exploring the western end of the Bulls Run road, is a good afternoon ride from Wellington, with changing vistas and plenty of climbing. The road is steep in places, and narrows quickly after climbing away from the Hutt valley; but it's perfect cycling, though beautiful forest roads. Note: the mapped route goes through a golf course on the west bank of the Hutt river. I believed there was a trail there after looking at Google Maps; there isn't. However, a nice lady came out of the clubhouse, put down her Martini, and explained I should follow the trees next to the river bank, hop over a grassy bank onto a wide trail next to the railway; and ignore any golfists who complained at me while hitting small dimpled balls around a scruffy lawn. I thanked her profusely, despite the fact I was not offered a drink. On the Moonshine hill road, hot summer day; doesn't get better than this. 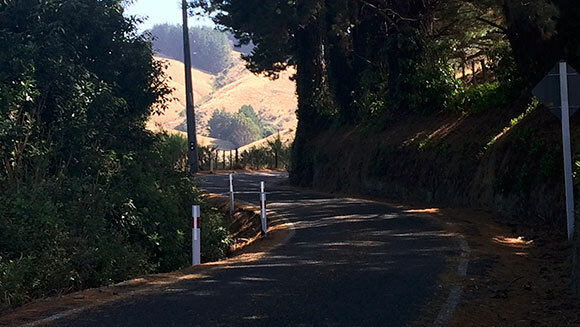 Akatarawa Road is a classic road ride which makes an ideal one way ride from Waikanae to Wellington given the prevailing winds in summer are notherly. The climb up the north side of the road is steeper than the south side, giving a moderate climb and a long descent down towards the Hutt Valley. An interesting option is to turn onto the Hutt River Trail southbound at the bridge of the Hutt River just past Bridge Road. You can follow the River Trail to Petone, then ride along the seashore before jumping onto the cycle lane on the Hutt Road back to Wellington. I always ride the lane on the road, despite there being a separate fenced off path most of the way; it's usually covered in broken glass. Side note: some people do, indeed, seem to think it's funny to leave broken glass down on cycle paths. You encounter broken glass so often on cycle paths, this is the most likely explanation; it wouldn't just happen. But it seems unlikely there are that many people doing it. It's probably just a few. Would it be that hard to just find these people and punish them? And if they ever do it again, you know, punish them harder? An easy way to cross the Belmont range is to follow the Paekakariki hill road route at the top of this page as far as the gas station on the ridgeline, then descend to the Hutt via Hill Road and Normandale Road. This is a fine ride and goes well on a mountain or gravel bike. If on the latter, watch out for the middle (mostly flat) section between the top of Hill Road and the start of the descent to Belmont Road. It's badly weathered and some of the flood ruts are nearly half a metre deep. There's less than a kilometre of this (as at October 2016) - the rest of it is easy. Singletrack diversions are shown on information boards at various points through the park. The descent into Normandale is altogether peachy. I've also ridden this route the other way, into a more-or-less full-on norwester. That, or a straight-up northerly, are very common in the Belmont. The climb itself is surprisingly sheltered most of the way up, including very near the top; the norwester is actually more of a problem if you choose to return by the East Arm of Porirua Harbour, which gives you several kms of headwind torture along the south shore. Gearing on adventure road bikes: what's the story? Gearing on road bikes - who uses 50:11?